Suitable for brain tumour patients? I recently posted about how reviews can boost Google rankings. Google does a great job of helping us find what we are looking for by incorporating third party information such as reviews and links, and it also crawls websites assessing content and context. Six months ago, shortly after I posted on the subject of headaches, Google started serving this advert on my blog (pictured left), in the advertising panel just to the right of this post. I don't know what the ad was for (clicking on it would be a breach of the Adsense publishers terms and conditions), but since my post was about my surgery and lucky escape from a brain tumour, it probably wasn't the most suitable ad to serve. From time to time since, I've seen the ad appearing on my blog - you might even see it now if you look to the right. I hope it isn't causing any offense to people whose experience of brain tumours has not been as positive as mine. 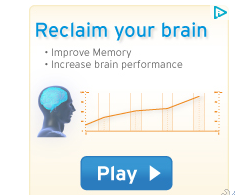 Perhaps I'm being unfair - perhaps the advertiser really can help you reclaim your brain, improve memory and increase brain performance. Unfortunately I'm contractually forbidden from finding out.